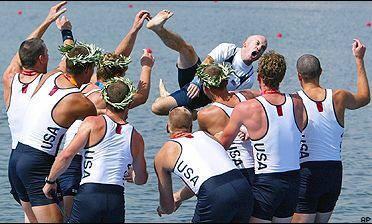 U.S. men cooled down coxswain Pete Cipollone after the win. The favored American women's elite eight crew settled for silver Sunday. But their male counterparts came through in a big way, ending a four-decade drought in rowing gold. The U.S. men were never threatened, clocking 5:42.28. EMS chief and 9-11 rescue worker Jason Read balances those weighty responsibilities with his other life as an elite rower. Page 2's Jim Caple goes rowing with a crew team and learns a lot about ... life. Three-time Olympian Laurel Korholz joins 14 other Olympic veterans on the U.S. Olympic rowing team for the Athens Games. Aquil Hashim Abdullah became the first black male rower to qualify for the U.S. Olympic squad Wednesday, teaming with U.S. Navy officer Henry Gantt Nuzum to win double skulls at the Qualified Olympic Small Boat Trials. Artour Samsonov and Luke Walton of the Harvard boat club led four men's pairs crews into the finals of the U.S. Olympic Team rowing trials Monday. Jennifer Devine advanced to the Olympic Qualification Regatta by winning the women's single sculls at the Non-Qualified Olympic Small Boat Trials on Lake Mercer on Saturday.